Exclusive and creative guided tours to discover the best traditional craft breweries in Prague and across idyllic Czech countryside with your personal chef and experienced foodie journalist. A customised and exclusive guided walking tour in Prague historic center to discover the techniques, the secrets and the flavors of traditional Czech beer, a national pride. 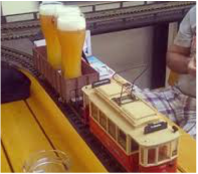 ​We will visit at least two of the best micro-breweries where we will taste a selection of traditional Pilsen and seasonal specialties, paired with the tasty appetizers of the bohemian cuisine, known by the locals as "food with beer". ​During the tour you will admire the historic monuments, off-the-beaten-path modern art and learn legends, habits and curiosities of the city from the experience of your personal chef and food journalist. The tour is highly customizable according to your specific requests and created for small groups. Price per person: € 90 (1 participant), € 60 (2 participants), € 50 (3 or more participants). Departure time: 10 am, 2 pm, 5 pm. Other timings are available upon clients´ requests. Departure point: Charles Bridge, Prague 1. Hotel pick-up or other departure point from Prague center upon agreement. The price includes: English-speaking guide, tasting of 3 high-quality craft beers and one traditional tasty brewery appetizer per person. Beer is one of the oldest and healthiest drinks known to mankind: enjoy a delightful beer spa experience and a relaxing massage in the private luxury of an elegant, family-run microbrewery in a cosy village close to Prague center, but way off the beaten path. ​An unforgettable experience in which you will learn the secrets and techniques of brewing, pamper your soul and body with a rejuvenating bath in brewer’s yeast with unlimited consumption of premium craft beer, and enjoy a gourmet degustation menu with beer pairing discovering classic bohemian dishes with a refined touch. Including private transportation from/to Prague. Duration: 3.5 hours, of which 1 of beer spa procedures. Departure time: the Beer Spa private procedure is available from 11 am to 9 pm according to availability (advance booking necessary), followed by the beer tasting with gourmet menu. The price includes: Beer Spa procedure with unlimited consumption of craft beer (60 min), a relaxing massage, and a degustation menu in the brewery´s restaurant (appetizer, main course, dessert) with craft beer pairing. English-speaking guide, transfer from/to Prague hotels by private car. Dedicated to the true beer lovers who want to enjoy the vibrant city life like a local: rumble across town with your personal guide, a passionate chef and beer journalist discovering some of the best mini-breweries known only to locals, typical atmospheric pubs and the true city mood, grazing tasty pub snacks & street food during your adventure. A bit of walk and quick tram rides will offer unusual views of the city and its true essence, and plenty of tips about the beer festivals and cultural events. Departure time: 10 am, 2 pm, 5 pm. Other timings are available upon clients´ requests and according to Staropramen visit timing. The tour includes: English-speaking guide and personal chef, tasting of 3 craft beers, daily ticket valid for Prague public transport network. The city of Pilsen is the heartland of Czech beers, giving the name to the most popular type of beer on the planet. We visit the Pilsner Urquell plant with its brewhouses from 3 different centuries, the Brewery Museum to breathe the atmosphere of the Middle Ages and discover the secrets and legends of beer production in an original house from the 15th century. Beer is still produced today in the brewery cellars following the traditional method: fermentation in open wooden kegs and maturation in oak-laying down barrels. The tour includes a tasting of this unfiltered and non-pasteurized nectar and a Pilsen city tour. Departure time: 10 a.m. Other timings are available upon clients` requests and according to Pilsner Urquell plant visit timing. The tour includes: guided visit of Pilsner Urquell brewery and Beer Museum, English-speaking guide, tasting of 2 traditional beers, transportation by private car for the whole tour. A guided tour with standard or electric bicycle through Prague green riverside and historic center to discover the techniques, the secrets and the flavors of traditional Czech beer. We pedal through the Jewish Quarter, Old Town Square, Letna park viewpoint and Prague Castle to admire St. Vitus Cathedral and Loreto church. We visit the traditional brewery of Strahov monastery built in 1140, with stunning views over the whole City, and taste its traditional beers. We discover the Břevnov monastery brewery and admire the baroque church founded in 993, then the star-shaped Hvězda renaissance villa and its lush forested park. Price per person: € 90 (1 participant), € 60 (2 participants), € 50 (3 or more participants). Supplement for electric bicycle: € 10. Departure time: 10 am and 2 pm, other timings are available upon clients´ requests without extra charge. Timing: daily Monday to Sunday, all year round. The tour includes: English-speaking guide, tasting of 2 high-quality beers, rental of quality bicycle with helmet, video and photo-reportage with HD action camera. A guided walking tour to discover the atmosphere, history and obscure legends of Prague Old Town and Jewish Quarter through a glass of beer, one of the oldest and healthiest drinks known to mankind. ​Enjoy the health benefits and the relaxing atmosphere of the luxury Beer Spa with a private 60 minutes session in an elegant Unesco-heritage hotel. We will then visit a traditional mini-brewery to enjoy a selection of high-quality craft beers paired with the tasty traditional bohemian cuisine. All our exclusive tours are designed and provided by, experienced motivated, enthusiastic, multi-language guides. The Czech Republic is the true beer paradise. Centuries of tradition, constant passionate care and ideal agricultural conditions for hops and yests, guarantee the best brewing results of pale, amber and dark lagers. Chronicles place their cultivation in Bohemia as early as 859 A.D. Bohemian hops were so prized that King Wenceslav ordered the death penalty for anyone caught exporting the cuttings, from which new plants could be grown. 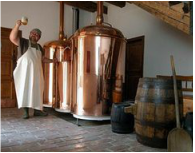 Only citizens in the Czech lands had the right to brew beer - and that for their own consumption - so most citizens had a micro brewery in their home and the tradition spread to thousands of mini-breweries. Discover the traditions and secrets of perfect brewing and taste infinite varieties of beers.